Mia’s ordinary life is disrupted for good in the most horrifying way possible when she is possessed by a hungry and powerful demon—and saved only by the arrival of relatives from Italy, the country her grandfather fled many decades ago. Now her cousins, the charming and gorgeous Emilio and stern, elderly Giuliano, say the only way to keep Mia safe is for her to come back with them to Milan, to live, to learn Italian, to fall in and out of love, and to master the family trade: fighting all demons with the ancient lore of bell, book, and candle. Milan is not what Mia expected, but it will change her forever. Oh heavens, I adored this book! I'm not one for demon-type stories, normally, but this book had just the perfect balance of self-exploration, learning, history, family and Italy! I constantly found myself wanting to be in Italy among the Delle Torre family (minus the demon catching part), living life surrounded by such rich, storied places and people. Mia is a great character. And her journey from a wayward, English-speaking American family member to a repatriated Italian, speaking fluent Italian is so convincing as a story line! Using the learning curve as a literary device literally drags the reader right off of their sofa and into Mia's story. I could picture myself with her family members, walking down the streets of Milan, practicing verb tenses, passing the Duomo, cooking Panettone in the kitchen of an old family home for Christmas and attending mass in a historic, Catholic Cathedral. And I'm not Catholic. Gah! Note to self: Must.Move.To.Italy! Absolutely captivating writing. The one thing I didn't like about this story is the same thing that the entire plot pivots upon, demons. I was both fascinated and horrified by this aspect of the book. It creeped me out just enough to read with my bedroom door securely locked at night. (As if that would help!) 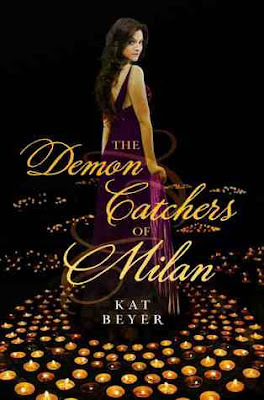 I guess it would be fair to say that I really, really tend to shy away from stories that lean more to the horror side of things, and, knowing that, I would also have to say that The Demon Catchers of Milan approaches a horrific subject in a cool-teen-acceptable way, with care, compassion and craft. Don't worry, it's nothing like the exorcist. I liked this book so much that I kept reading, right past the end. (How is that possible?) I read the author's credits and note and just found myself staring at the last page (on my Kindle) thinking, Wow! Wow. Wow. I want more! PS, Ms Kat Beyer, I'm from NorCal and love the delicious irony of the children from your youth growing up in Palo Alto striving to get into Harvard. Ms Authoress, you've a way with a story. I certainly cannot wait for the next installation of Mia and the Delle Torre family, it's sure to be lovely, horrific and fascinating all at once!! Bravo. Note: I wouldn't recommend this for middle-readers because of the subject matter, but it's definitely something I would have loved in high school. Thanks! I'm glad you enjoyed it. I really enjoyed the book. What did you read that you hated??? LOL! I don't know that I'd pick this one up - because I just don't do demon's... I'm such a scaredy cat, and fairly superstitious, so my mind wanders and it's not typically good!